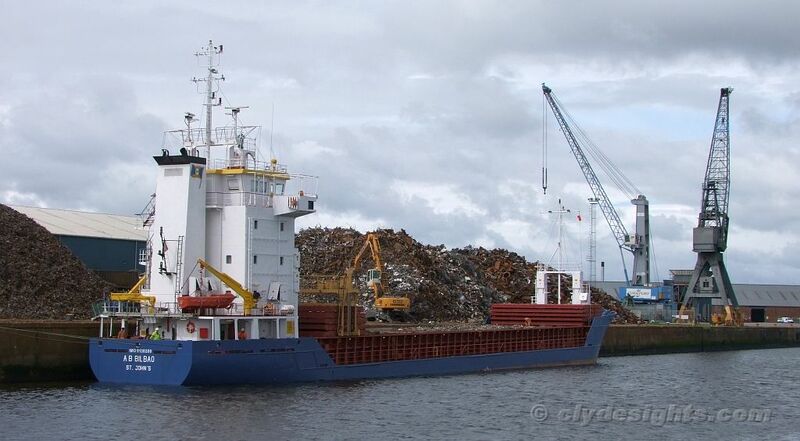 Almost finished loading scrap metal at Shieldhall, the coaster A.B. BILBAO sailed shortly after this picture was taken for Pasajes. The two cranes ahead of her on the Riverside quay represent two different generations. On the left, the modern trend and is one of a pair at the berth, while on the right is one of the survivors from an earlier age and dates from when the dock was opened in the 1920s. A similar crane was dismantled recently and scrapped on site.